A Fortieth-Day Divine Liturgy will be held on Sunday, May 20, 2018 at 10:00 am at St. Elias Antiochican Orthodox Cathedral, 2975 Riverside Drive. Dear daughter of the late Fares and Mahiba Saab. Beloved wife of George Saab. Much loved mother of Vivian Babikian (Shahe) and Elie Saab (Mayada). 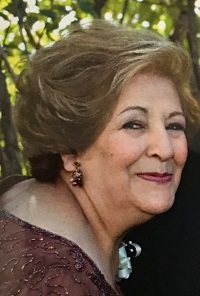 Caring grandmother of Elias and Anabel Saab; Marina, Zaven and Hovannes Babikian. Dearest sister of the late Nouhad Adam (late Antoine) and late Nasri Saab (Mary). Loving aunt of Sonia Tannis (Mike), Maurice Saab, Andre Saab (Melissa), Anita Azzi (Badih) and Leon Adam (Deborah). Passed away on Sunday, April 15, 2018 .